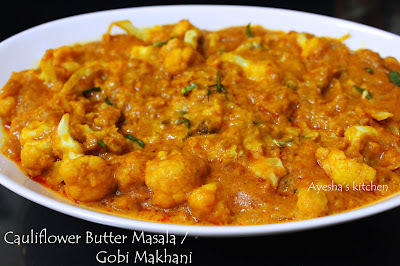 Gobi makhani / cauliflower butter masala is another popular Makhani or butter masala recipe. Like Murgh makhani / Butter chicken or Dal makhani which are the most well known Indian dishes (Indian food) around the world, this dish has a rich creamy spicy flavor. Trust me, it tastes really yummy. So let's have a look at the recipe. I love to prepare the makhani gravy / makhani sauce (butter masala) in advance. You too can try that...so that you can have a royal dinner or lunch within no time. 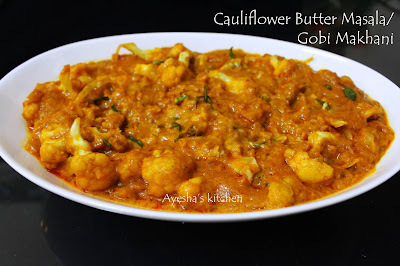 It's too interesting...Do try this recipe showing how to make cauliflower recipes Indian / Indian cauliflower recipes / vegan curry recipe / easy cauliflower recipes/recipes with cauliflower and enjoy cooking. Now let's make a basic MAKHANI GRAVY WHICH CAN BE USED IN MANY VEG AND NON VEG DISHES (gravy can be refrigerated for days). Heat oil in a pressure cooker and add the sliced onion. Saute for 5 minutes and then add salt, ginger garlic paste. Saute it until the raw smell is gone. Add the tomatoes, cashews, red chilies, green chilies, garam masala powder, turmeric powder, red chili powder. Mix it well and pressure cook it for 4 -5 whistles (15 minutes) in a low flame without adding water as tomato will release water once hot. When done, let it cool and drain out the water to a bowl using a strainer and then take the onion tomato into the blender. Blend it well to a paste and again strain it into the bowl. Discard the seeds and peels of tomato. Cook the strained paste of onion and tomato for 15 minutes in a pan. Add salt, sugar, Kasuri methi and mix well. Switch off the flame. Take a bowl and mix together all the ingredients given under marination. Make a thick paste by adding a little water. Marinate the cauliflower/gobi florets with this marinade. Heat a pan with few tsp of oil and shallow fry on both sides until slightly golden. When done transfer it to plate. In the same pan add some makhani gravy along with butter and fried gobi. Cook it for 2 minutes. Now add the fresh cream and mix well. Serve hot with pulka, nan, roti etc..